With Tuesday’s Q & A with Rocco Grimaldi taking up plenty of space, I left out our links and commentary for other prospects. I couldn’t just let you get out of the week without more prospect news. In fact, we’re going to double up our prospect coverage every week from here on out. 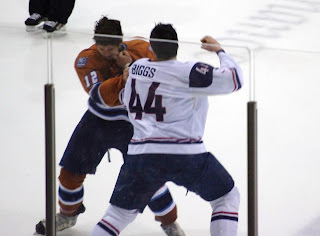 Tuesdays and Thursdays will always give you the most up-to-date news and notes on American hockey prospects. Eleven of the 15 players, including the top five, on Allen’s list have ties to the National Team Development Program, which makes sense because Allen is a native of Southeast Michigan, so he’s in touch with plenty of the USA Hockey folks. Side Note: Philippe Hudon, who is on the list, is not American. He’s a native of Quebec, but he is playing American prep school hockey at Choate-Rosemary Hall. Still, it’s a great list for you prospect junkies. After the jump: News and links for Chase Balisy, Jamie Oleksiak, J.T. Miller, John Gibson, Colin Jacobs and Scott Mayfield. Chase Balisy is having an outstanding freshman season for one of the most surprising teams in college hockey, Western Michigan. He currently leads the Broncos with 26 points (10-16). Balisy was named the CCHA’s Rookie of the Month for January after posting 12 points (5-7) and a plus-7 rating in eight games. After being passed over last year, he is still draft eligible for 2011. In a more shallow draft year, Balisy may be worth a late-round stab. He’s not the biggest or strongest guy, but he’s a heady player that distributes the puck well and rarely makes mistakes. Oddly enough, Balisy is our next featured Q & A coming up on Tuesday. So stay tuned for that. I’ll try not to say this every single week, but Ryan Kennedy’s “The Hot List” over at thehockeynews.com should be a weekly stop for you, if you like prospects. The featured player this week is Northeastern University’s Jamie Oleksiak, who is gearing up for the Beanpot Tournament. 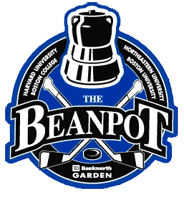 The Beanpot could be a huge opportunity for Oleksiak to prove himself, but it will also be a challenge for Boston University’s Matthew Nieto and Adam Clendening. The pair have both had up and down years, but possess elite skills. In the NCAA regular season, there are few better opportunities to shine under the spotlight than at the Beanpot. Also getting some love on The Hot List this week is J.T. Miller who may be getting a boost from playing with Rocco Grimaldi of late. The two will be teammates at North Dakota next fall, but Ron Rolston has paired them up in recent weeks, with great success. Miller scored the OT winner against Cedar Rapids on Jan. 28 to cap a three-point night in a huge USHL win for the U.S. National Under-18 Team. Grimaldi assisted on both of Miller’s goals in that game. Top-rated goaltender John Gibson is coming off arguably his best start of the entire season. He earned a huge USHL win at Green Bay Saturday night, stopping 30-of-31 shots in front of the largest crowd ever to see a USHL regular-season game. Gibson nearly spoiled “Teddy Bear Night” in which the home fans throw teddy bears on the ice after the Gamblers’ first goal. Thankfully, for the home side, William Kessel scored at 8:11 of the second period to make this happen. Despite giving up the teddy bear goal, Gibson’s only getting better as the season goes on and has a chance to separate himself from the pack at the 2011 Five Nations Cup and World U18 Championship. Good showings at both probably put him in the late first round. Texas native and Seattle Thunderbird Colin Jacobs was interviewed on The Pipeline Show on Tuesday night. Jacobs talked about hockey in Texas, the draft, Top Prospects and his struggling Seattle club. He’s got 17 goals and 17 assists this season in the WHL. He’s also a poster child for the NHL’s southern teams getting kids interested in hockey. The USHL’s top ranked player, Scott Mayfield, of the Youngstown Phantoms has a blog going over at NHL.com. I’m sure we’ll see plenty more from Mayfield as we continue the march toward the draft. Despite Youngstown’s struggles in league play, Mayfield is a plus-1 and scouts just love his size and toughness. Very big upside. Click on the picture for Dan Sallows’s Q & A with Mayfield from a while back. We’ve got plenty more prospect news coming up next week including the interview with Chase Balisy and a look at more under-the-radar prospects for the 2011 NHL Entry Draft. Don’t forget to let me know which prospects you want to hear about over at our new Facebook page. This entry was posted in American Prospects, Junior Hockey, NCAA, NHL Draft, NTDP. Bookmark the permalink.